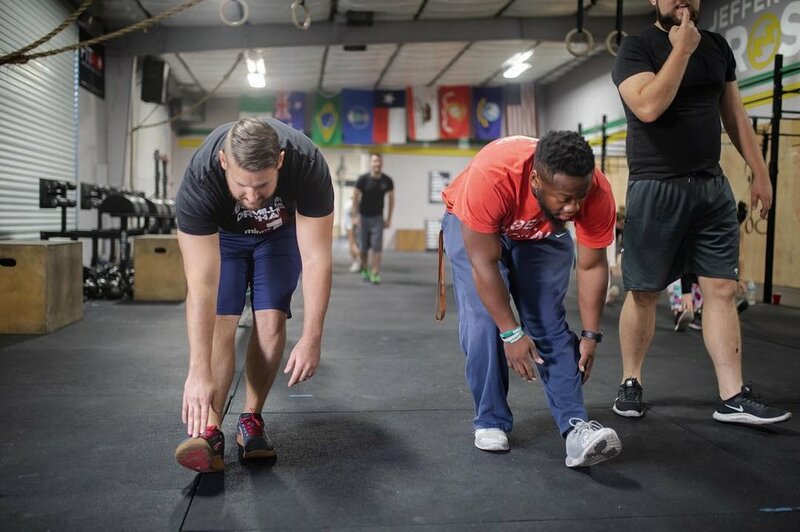 In CrossFit (heck, in life in general) it’s easy to get discouraged, thinking that you may not be progressing fast enough or that other people are farther along on their fitness journey than you are. It’s great to have goals (in fact, we highly recommend it), but you can’t look ahead and get discouraged. Instead, look back at how far you’ve come, especially if you’re just a few months into your fitness walk. Look back at how far you’ve come in the last month, the last year, heck, look at how far you’ve come since you started…the fact is, beginner you would be stoked to be where you are now. Odds are, you’d be your hero. And that’s pretty damn cool. Don’t get bogged down in how far you have to go still, because you’ll always be moving forward. Look back and see how much progress you’ve made, and more importantly: celebrate it! You’re becoming your own hero every day. Keep up the great work, guys! We’ll see you at the box. Remember how fun recess was a kid? And remember how much running laps in PE class sucked? Make your time at CrossFit recess, not PE class. Click below to read more. Yesterday I overheard a question that started the wheels turning. "Isn't your position highly sought after?" The guy answering the question replied that the position was desired but surprisingly few were willing to dedicate the time, effort and sacrifice required to apply for that position. Online, on tv, at competitions, at the beach, in the gym, at work, nearly everywhere, we are faced with people who have muscles we desire, body types we desire, and athletic prowess we desire. But desiring is not enough. Are you willing to do what it takes to achieve those things? Take four count breath in through your nose... Hold it in for a four count... Exhale while you count to four... Keep your lungs empty to a count of four. Boom. You just learned how to breathe tactically. Next time your heart rate starts screaming and your body goes into panic mode right before the clock starts on "Fran", try breathing. Doing a couple of breathing cycles like this will reduce your heart rate, lower your anxiety and help you maintain control of your body. Although the system is a lot more complicated, your heart's purpose is pretty much to provide oxygen to all your cells. So if your heart is pounding and you aren't breathing well, it's not able to do its job. Take a breath. It always surprises me when I am doing a workout and someone tells me to breathe. I take a big, deep breath and suddenly feel so much better. Breathing seems like something we shouldn't have to worry about, but time and time again we forget to breathe when it is most important! When performing repetitive movements, like running, rowing, burpees and thrusters, try to get a rhythm going for your breathing and movement. When you have to take a break, don't fold over at the waist, stand tall and open up your diaphragm and ribs so you can get the largest volume of oxygen possible. Breathe in, breathe out, work hard. CrossFit is hard. Really hard. Pretty much the most challenging thing you've ever done. So be positive. There is no need to make it more difficult by preparing for defeat when we talk and think about the workout! You know what's awesome about super hard workouts? Super awesome results! So the next time you see the WOD posted and it looks brutal or is one of your weaknesses, smile and think about the benefits you will receive from it. Oh, and another thing, some science types did a study that showed that people who enjoyed working out (mindset) lost more weight and got better results than people who viewed workouts negatively. Part of it was because the positive people felt like the workouts were a reward of sorts but the people who viewed them negatively would reward themselves with treats that they felt they earned. We all have days in the gym that are brutal and we tell ourselves we earned that junk food, just don't let that kind of thinking become habit. And don't defeat yourself before you even grab that bar for a new PR attempt. I'm sure you have heard, "I don't think I can lift this." My response? "You're not going to with that attitude!" Mindset is huge. I just met a pilot, at the airport of all places, who has been flying for 50 years! As I was starting my car to take my son home, I complimented his plane and it opened the door. He walked over and talked my ear off about flying and how excited it makes him to see young people interested in aviation. Usually, when strangers 40 years to my senior start talking, I make an effort to listen and be respectful, but this guy was so passionate about flying that no effort was needed. It was cool to see how excited he still got just talking about his passion. Passion is something more than dedication or responsibility. Passion is the fuel for those two things. It's a lot easier to choose healthy foods and show up to that workout with all the movements you dread when your passion requires you to be at your best physically. I'm not saying your passion has to be exercise. But your passion may be what motivates you to exercise and stick with that certain way of eating. While sitting through some training, which was a painful event, I started trying to figure out how the training could be improved. The material and subject matter themselves were important and good, but the presentation was horrible! That's when it hit me. The instructor had no idea what the objective of the course was. As a result, the rest of us were frustrated with the instruction, frustrated with the material and frustrated with the waste of time. So why am I talking about this on a CrossFit blog? I realized that doing CrossFit without a clear objective is a good way to end up frustrated with the instruction, frustrated with the material and frustrated with the waste of time. I know why I do CrossFit, to be able to go rock climbing, backpacking and have adventures long into my life. Why do you do CrossFit? This is a subject I have specifically avoided because at times I do not feel like I know about every diet out there to tell you whether you should or you should not eat a certain way. So I will just tell you what I try to do, what I have done and what I think is a good direction to head in your nutrition journey. First off, exercise is great for you, but to say that exercise alone will get you to your ideal weight is very flawed. Heading over to the nearest McDonald’s after every work out for a super-sized meal with a big soda followed by a McFlurry after every work out because you “earned it” will set you back every time, no matter how hard you worked out. Changing your diet is not easy. If we are going to change our diet up to achieve weight loss and performance goals, we need to do it in a way that is sustainable. My preferred dietary guidelines come from the book “Enter the Zone” by Dr. Barry Sears. My best performances in the gym came at a time I was weighing and measuring my food daily. I lost body fat and lifted bigger weights. Staying that strict was a huge challenge! But it did teach me a lot about how to eat. Now, not that it always happens, but I try to get a protein, carb and fat in at every meal and as close to appropriate portions as possible. So here is what I think. I think you should think about what you eat everyday. Don’t lie to yourself. We all know what is healthy and what is not. Identify one thing you could change. Stick with it, then when you are comfortable with that change, work on another part of the diet. If you are interested in tackling the “Zone” hit me up. There are a few key points about body fat percentage, protein and fat intake that are crucial to success. This is Heather (aka HBTT, Tink, Mighty Mouse, Little One, Lil' Bit, and any other small person reference you can imagine) She is an accountant; I will let you make your own assumptions. I have loved watching her transition from having to be at the gym to spending extra time at the gym. She is proof that there is no one type of CrossFitter and that the gym is NOT just for people who want to get huge or want to lose weight. Thank you for writing a testimonial of your experience at J-State CrossFit. Heather, your drive is inspiring, your fight is mighty, and your attitude is always contagious. You are Jefferson State CrossFit. I never would have thought I'd look forward to a workout, but Jefferson State has really changed me! I've always hated working out and was in terrible shape. I would just sit on a couch all day if I could - really, ask my husband. I had no motivation at all to do anything physical - even a casual walk around the block seemed too much effort at times. One day, I just decided that I was certainly not getting any younger, and there would be a point when I wouldn't even have the option to exercise anymore. I decided to take advantage of the time I had to start getting in shape instead of wasting my time on the couch. I started going to Jefferson State in July 2013 and it's been absolutely amazing! I look forward to pushing myself, and it's been so encouraging to see how much fitter and stronger I've become. The coaches have really worked with me to teach me all of the different movements and to support me in achieving my fitness goals. I just completed my first 10k in November 2014 and I will be doing my half marathon in May 2015. Some people think that Crossfit is "too intense" for them, but if someone like me - Miss Couch Potato - can do it (and enjoy it!) then anyone can! I could fill this blog with quotes about perseverance, stories of famous people who failed more times than they want to count, but what good would that do for us? At the end of the day, it all comes down to personal responsibility.